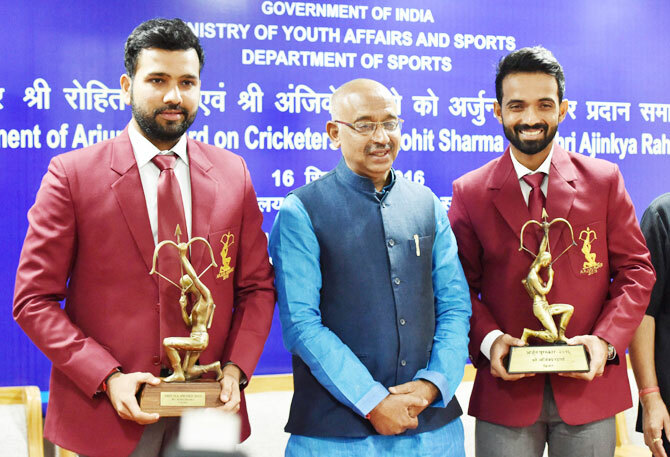 India cricketers Ajinkya Rahane and Rohit Sharma were, on Friday, conferred with the coveted Arjuna Award for this year and the previous year respectively by Sports Minister Vijay Goel in New Delhi. Rahane and Rohit, who have been named in the Indian team for the three-Test series against New Zealand, beginning on September 22, were honoured with the Arjuna Awards at a function held at the Jawaharlal Nehru Stadium. Rahane and Rohit could not receive the Arjuna Awards from the President of India earlier, as they were participating in international tournaments. Speaking on the occasion, Goel said that while there's no doubt that cricket is among the most popular games in India, the current government under the leadership of Prime Minister Narendra Modi is committed to promote indigenous and other sports as well. He said the recent success of the country's athletes at the Paralympic Games in Rio de Janeiro has made every Indian proud. The Arjuna Awards, instituted in 1961, are given to sportspersons for consistent outstanding performance for four years preceding the year of award and who have also shown qualities of leadership, sportsmanship and a sense of discipline. The awardees are given a statuette, a certificate, ceremonial dress and prize money of Rs 5 lakh.